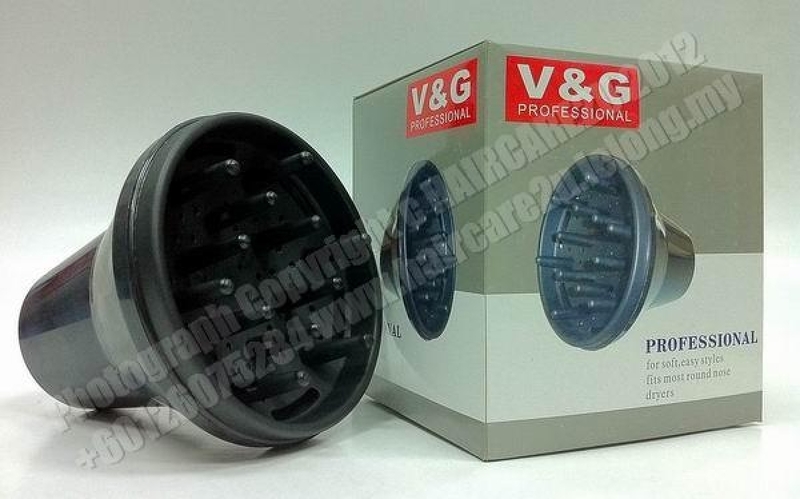 The V&G H-080 Professional Hair Diffuser is specifically designed for the professional hairstylist. It features unique finger extenders interacting with the artist for the creation of softness and design, enhanced volume, and superior styling control. This heat resistant finger diffuser evenly distributes air to allow for gentle drying, especially good to use on curly hair. Unique wind outlet, equal hot wind distribution. Optimal shaping speed and shaping effect. Novel and streamline appearance design. High temperature resistant of anti-aging plastic shell. Designed to fit all commercially available hair dryers. Carefully manufactured with quality materials to guarantee long life. Step 1: Take a shower and apply your hair products (i.e. gel, mouse, etc.). Then scrunch some of the moisture out of your hair with a cotton cloth (or tshirt) because a terry cloth towel will cause frizz. You can also try plopping your hair if you have 10-15 minutes to spare. Step 2: Attach the diffuser to your hair dryer. Step 3: Section out some hair that will fit and place it over the diffuser. Step 4: Move the hair dryer upwards so the hair is scrunched against your head by the diffuser. Step 5: Turn the hair dryer on and wait for 30-45 seconds, with it still pressed against your head. If it gets too hot press the cool shot button or move the diffuse away slightly. Step 6: Turn the hair dryer off and pick out another section. This is crucial the farther away the diffuser is from your head, the more it will blow your hair around and creating frizz. Step 7: Continue until your hair is about 80% dry. Drying all they way will cause frizz. Step 8: Use a little gel or a light spray product to set your hair. Enjoy your curls!